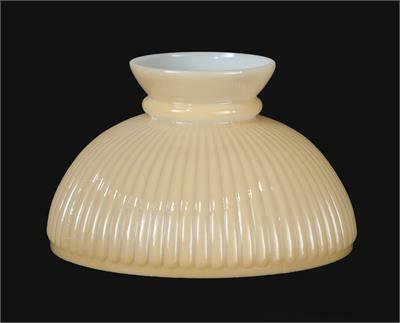 This lovely Nu Gold tinted ribbed lamp shade features light tan colored glass over opal white. The shade always a warm, soft glow with either kerosene or electrified table lamps. The shade has a 10" base diameter fitter, and measures 6 1/8" high. The lamp shade is well suited for Aladdin table lamps, as well as Miller, Rayo, B & H and others of similar stature. Imported glass. www.p65warnings.ca.gov.